Vacation rental cottage. 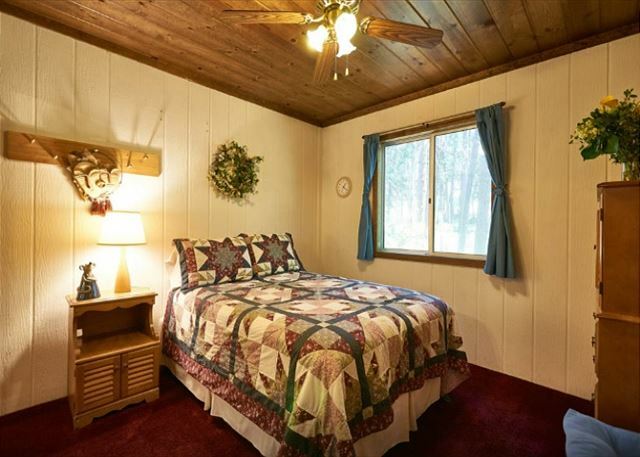 Sleeps 6, 2 bedrooms, 1 bathroom. Dogs allowed. Spacious Deck with patio furniture & tree views. Master bedroom with queen sized bed and patio access. Deer are often seen nearby since the home is in a peaceful area. Outdoor view of home. 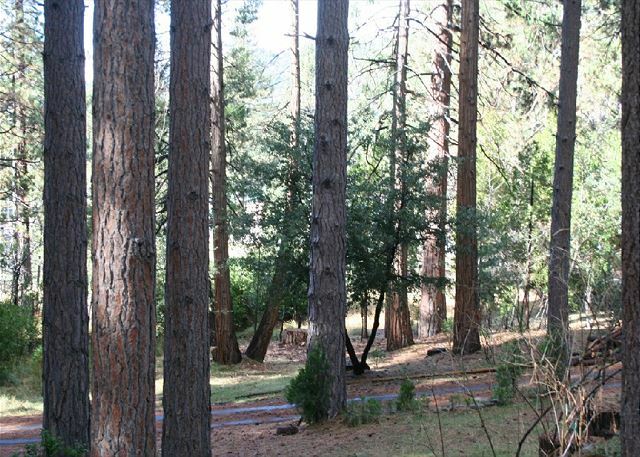 Home is nestled in the pines. Cozy cottage during the winter time. 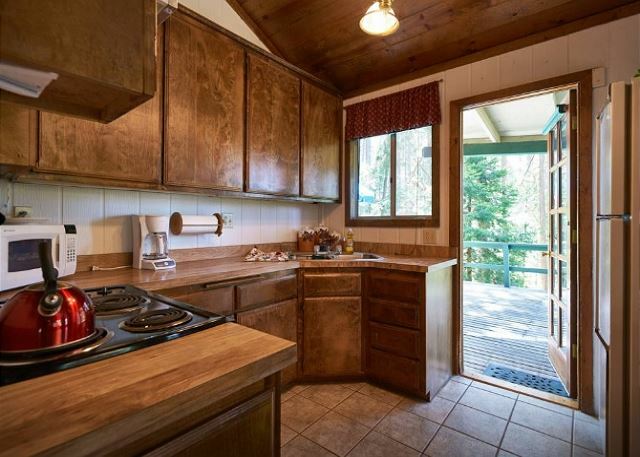 The “Cozy Cottage” is a charming home secluded in the woods of Idyllwild, CA. 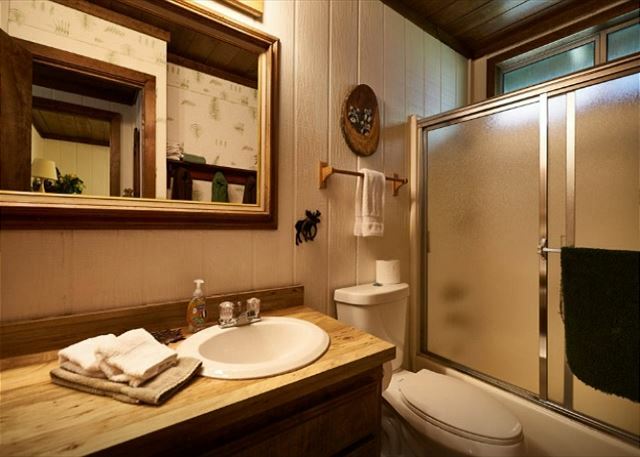 This home features 2 bedrooms plus loft and 1 bathroom. The loft is located above the living room and is perfect for small children to sleep and play. The loft is also great for storage for those extra long stays. There are Queen sized beds in both bedrooms. 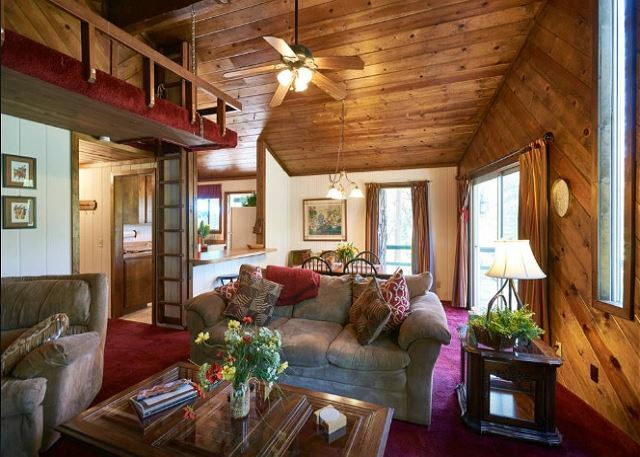 This home would be great for a romantic getaway or quiet relaxation for the family. The large deck is such an asset during the summertime-ideal for entertaining and star gazing! The property has a large area for children to run and play. During the winter, you can build your own sled runs and snowmen! Guests can roam around the property and create their own nature walks or it’s just a short walk to town! When booking our homes online or by phone, you may use the following payment methods: Debit or any major Visa, MasterCard or Discover. Weekend rate Friday/Saturday is $150.00 p/night. Weekday rate Sunday thru Thursday is $140.00 p/night. Winter Holiday rate $250.00 p/night (Thanksgiving, Christmas, New Year's Eve), with a 4 night minimum. 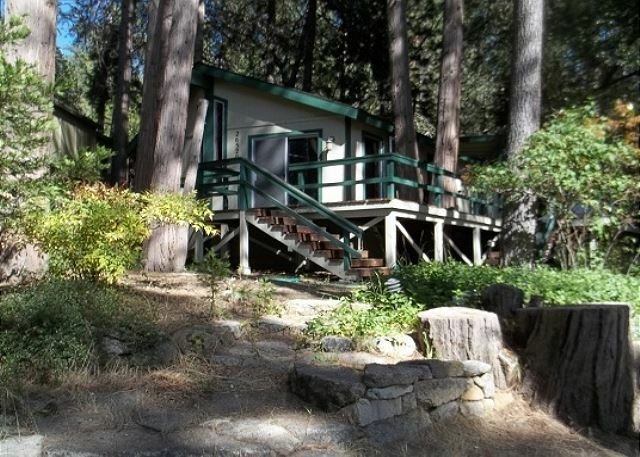 Holiday rate $200.00 p/night, a 3 day minimum may be required. Call us for our weekly/monthly specials. Pets are welcomed. Pet Fee will apply. Linen/Prep fee $90.00. Please note that during the Winter Holiday Season, (includes but is not limited to Thanksgiving, Christmas, Christmas Break and New Year’s Holiday), check-in time is after 4:00 PM, and check-out time is 10:00 AM. Guest cooperation in adhering to check-in/check-out time procedures during the Holiday Season is greatly appreciated and most helpful to our staff as well as your fellow vacationers in ensuring seamless check-ins for all New Spirit guests. We loved our weekend up in Idyllwild. The cabin was great, though quite dated. Our main issue was that we were not aware the cabin was located on an unsaved (thus unplowed) road, which is not ideal when you get 5” of snow overnight. 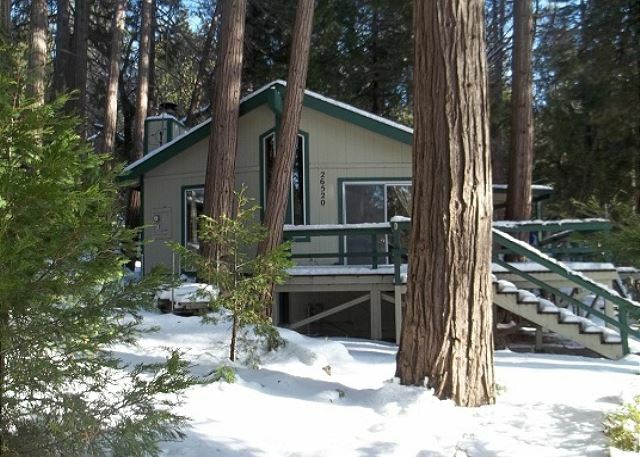 If this would have been a summer rental the location among the trees would have been ideal! Love the Cozy Cottage. The name fits. It is very comfortable & has all the necessities for a great time. Love the large deck & the views of the forest. It feels as if one is away from it all & secluded but actually it’s in walking distance to town. Found the inside to be very clean & ready for occupancy. The only issue that the owners need to be made aware of is the sorry condition of the deck & stairs. It is in dire need of repair & refinishing. My son loved climbing to the loft. I enjoyed the location with a forest for a backyard. I think there is a deer trail that runs through it, two walked through the day we left. The carpet and some details were a bit dated, but that’s about the only thing I could say about the place. Loved having a wood burning fireplace. I had a good experience. The place was clean and had what we needed. Sweet home with everything for a happy group. The house was clean, thoughtful and the kitchen had lots of pots and pans and outside a barbecue. Location was good. We'll be back again. We loved our cabin. It was spacious and clean in a great location. 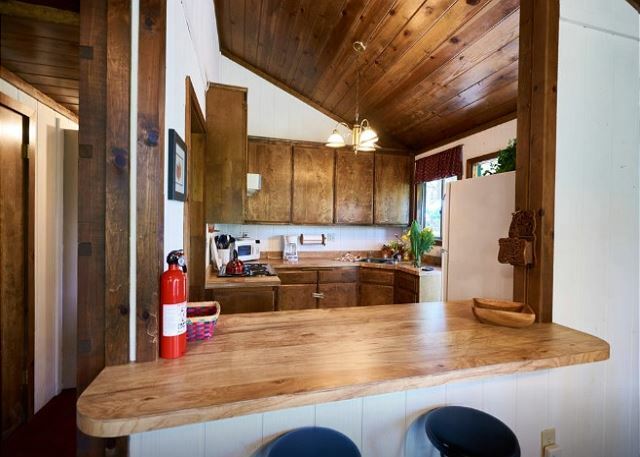 Great cabin, well stocked with kitchen and bath needs. It was very clean with exception of the loft which needed a little TLC to get rid of spiders and webs, but other than that it was tidy and clean. Location was very hard to find but when we called management they were attentive in helping us find it during after hours. The location was peaceful with large trees around. We enjoy sledding on the property too. Be sure to bring your our sleds. We loved the Cozy Cottage. We found it clean & comfortable. The kitchen was well supplied & easy to maneuver. But what was the icing on the cake was the large easily accessible deck. Since we were there for summer we "lived" on that deck morning to evening. Beautiful views from all directions gave it the feeling of being away deep in the forest, yet were in walking distance to town & just off Hy.243. Thank you or a wonderful stay. 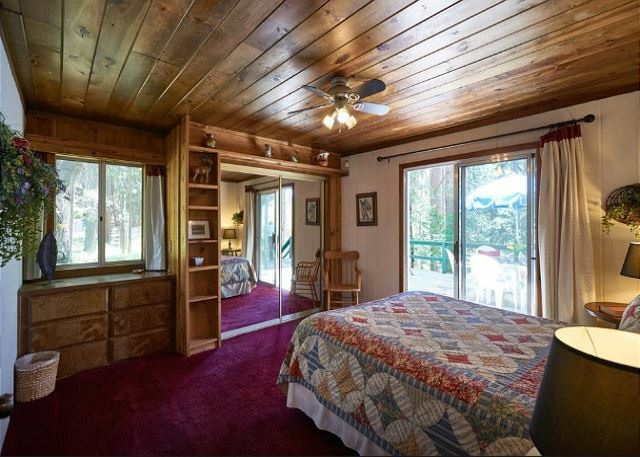 Lovely quaint cabin just outside of town. Very clean and well laid out. And Nickie and Monica - always the best team to work with. I needed this!! Thank you New Spirit for putting me in the perfect property for my get away and for helping to make my weekend totally stress free. The seclusion was awesome. I'll be back.